The Hotel Porto Veneziano is situated in the heart of the picturesque Old Town of Hania in the quiet east part of the Venetian harbor. Standing right next to the Venetian Arsenals, the hotel is just 300m. from the city centre and 1600m. from the nearest beach. It has 6 luxurious suites for 2 to 4 persons, which offer a marvellous view of the striking harbor, the White Mountains, the Old Town, the Cretan Sea and the West Peninsulas of Crete. Three have Queen-size beds and are ideal for honeymooners. 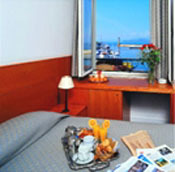 There are also 51 well-appointed rooms with all modern facilities. The distinctive, warm decor and the opportunity of enjoying breath-taking sunsets, will give you a unique holiday experience. 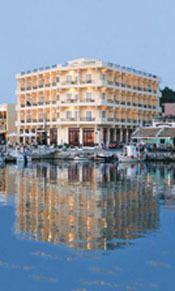 The hotel is highly recommended not only for vacations but business travel as well. All rooms have their own balcony, bathroom, wc / shower and are equipped with hair-dryer, air-condition/heating, direct dial telephone, music, satellite TV and mini-bar. There is a spacious lobby with sitting area and satellite TV, shoeshine machine and a 24 hours Reception service for exchange, safe deposit boxes, mail/fax, car rental, excursions, medical care, laundry/dry-cleaning, flower service, babysitting and taxi service. Guests can enjoy a lavish buffet breakfast in the hotel's comfortable restaurant, while the Internet cafe-bar set in a beautiful garden offers room service until late at night. There is also a parking area for guests right next to the hotel. Tennis, Basket and Volleyball courts, as well as Fitness and Health Clubs with sauna, massage and gymnasium facilities, scuba diving school and Sailing club just a short walk from the hotel. A range of water sports is available in a distance of approximately 4 km. Conference / meeting room for up to 40 persons with a full range of technical equipment and catering services. 24 hour taxi service. Regular public busses just 500 m. from the hotel. Transfer from / to the airport and from / to the ferry port arranged on request.